President Donald Trump credits his accord with North Korea's Kim Jong Un with saving tens of millions of people from nuclear war. Now he just has to get everyone else on board. Frustrated with lukewarm backing from congressional Republicans, criticism from Democratic opponents and skepticism from allies and the media, Trump made a stop Friday on the North Lawn of the White House to promote the nuclear deal that critics have criticized as vague and lacking in clear objectives. The surprise appearance on "Fox & Friends," followed by a combative round of questions with reporters, came two days after Trump returned from Singapore expecting a hero's welcome and tweeting that the world could "sleep well." Trump — who has long pitched himself as a master dealmaker — feels the agreement represents a radical step toward solving an intractable foreign policy problem and has been publicly and privately grumbling that not everyone agrees. Trump's frustrations are all the more notable now during the honeymoon phase of the deal, when a triumphant cloud of goodwill has yet to be tempered by reality. The U.S. goal of complete, verifiable and irreversible denuclearization, even in the most optimistic case, will likely take years — and that's assuming North Korea won't violate the accord, as it has every previous nuclear agreement. 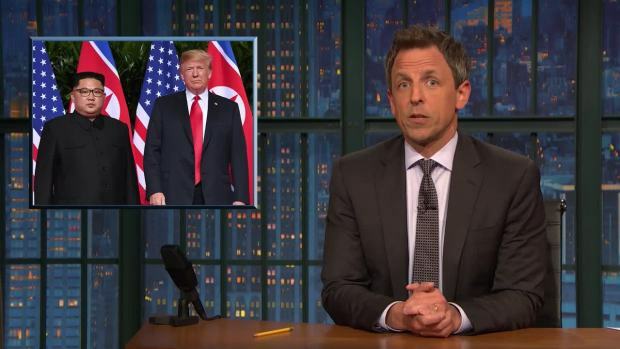 Seth Meyers takes a closer look at the historic meeting between President Donald Trump and North Korea's Kim Jong Un. Facing questions about his public embrace of Kim and the North Korean's autocratic leadership style — including what Trump said was a joke about the obedience of the autocratic Kim's advisers — the president said he was doing what is necessary for peace. "I don't want to see a nuclear weapon destroy you and your family," Trump told reporters. He added: "If you're fair, when I came in, people thought we were probably going to war with North Korea. ... If we did, millions of people would have been killed." The joint statement signed this week by Trump and Kim promises to work toward a denuclearized Korean peninsula, but includes no details on how or when weapons might be eliminated or even reduced. 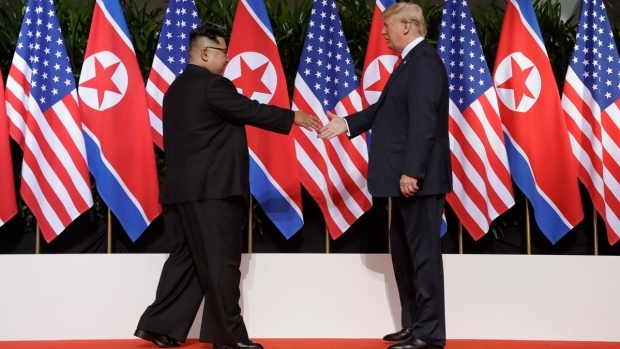 The summit marked the first meeting between a U.S. and North Korean leader in six decades of hostility and did mark a reduction in tensions from last fall, when Trump and Kim were trading insults that raised the specter of war. 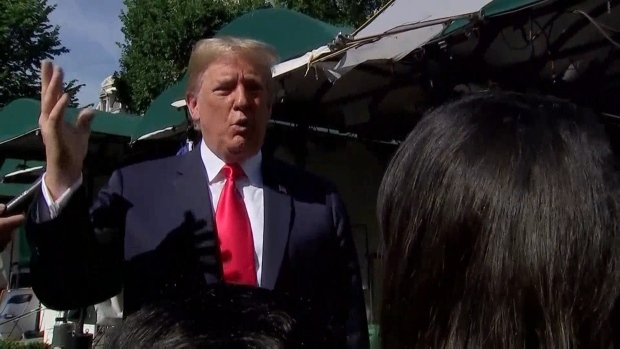 Trump emerged from the meeting convinced he could sell the vaguely worded deal, as evidenced by his hour-plus press conference in Singapore immediately after the sit-down. Since then, he has sent out a battery of tweets and messages, peaking with his Friday visit to the White House driveway. The impromptu press availability underscored Trump's isolation, increasingly relying on his own intuition, as he consults with a shrinking bench of advisers and is at odds with longtime international allies. "He's his own communications director. Once again his press team is trying to catch up to him," said GOP consultant Alex Conant. "He's focused more on the optics than the policy, which is a trend we've seen throughout this presidency." Trump also issued a video message Friday, defending the nuclear agreement and saying the U.S. must pursue a chance to avert nuclear conflict "at all costs." Trump said: "Our world has seen more than enough conflict. If there's a chance at peace, if there's a chance to end the horrible threat of nuclear conflict, then we must pursue it at all costs." One key frustration for Trump is his belief that his predecessor would have gotten a different reception — and that he should receive credit for making an agreement on an issue where former President Barack Obama was unable to make progress. Trump has been calling lawmakers to express enthusiasm for the agreement — but also complaining that he has not had more robust support from GOP lawmakers, said a person with knowledge of the calls, who spoke on condition of anonymity to share internal conversations. He also has been arguing that he has already done more than Obama. Among Trump's most vocal supporters is Secretary of State Mike Pompeo, who led negotiations with Pyongyang to set up the summit and will hold talks with the North to work out vital details of the deal. The challenge of defending the agreement became apparent earlier this week when Pompeo lashed out at a reporter asking how the U.S. would verify the North's compliance with the deal. "I find that question insulting and ridiculous and, frankly, ludicrous," Pompeo said in Seoul, where he was seeking to reassure U.S. ally South Korea about Trump's negotiation, including a surprise halt to joint military exercises involving the U.S. and South Korea. Trump's vigorous press strategy comes after a bare-bones messaging strategy around the actual summit, after the broadly worded joint statement signed by the president and Kim raised questions White House officials seemed unable to answer. Trump's announcement that he would halt the exercises appeared to catch Pentagon officials unaware and they initially said there was no change to planned exercises. White House staff said Trump's seat-of-the-pants changes on the day of the summit undercut their plans to roll out the agreement. Those plans included trying to change the time of his press conference — causing a logistical headache of moving the media into place — to deciding he personally wanted to reveal the contents of the deal live. He changed his mind after news photographs showing the signed agreement text appeared on television. The president's frustration also comes as his West Wing continues to hollow out. The latest departure news is that White House legislative director Marc Short has told staff he'll leave this summer, said two White House officials who were not authorized to speak publicly. And rumors persist that more top aides are looking for the exits, as it becomes increasingly challenging to find new hires. Associated Press writer Josh Lederman contributed.